"Official" website for the legendary punk rock band GBH from Birmingham, England. For over thirty years, they’ve been making music, making friends, and making trouble. They’ve toured the world, but stayed true to their Birmingham roots. In this book, bassist Ross Lomas tells his story. It’s the story of how punk rock, and love, saved his life. When Ross Lomas walked out of school, his teachers warned him he’d never amount to anything. He set out to prove them wrong. For over thirty years, he has toured the world with legendary UK punk band GBH, playing bass, making friends, and being constantly on the move. Now he’s stopped still for long enough to tell his story. 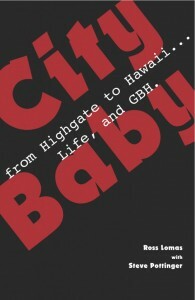 ‘City Baby’ is a no-holds-barred account of his life, from childhood to the present day. It’s an exhilarating read, though his teachers don’t come out of it too well. We’re very happy to be publishing Ross’s story on Ignite Books. Please note: ‘City Baby’ will be available exclusively from Ignite Books from early July until its official publication date in October.